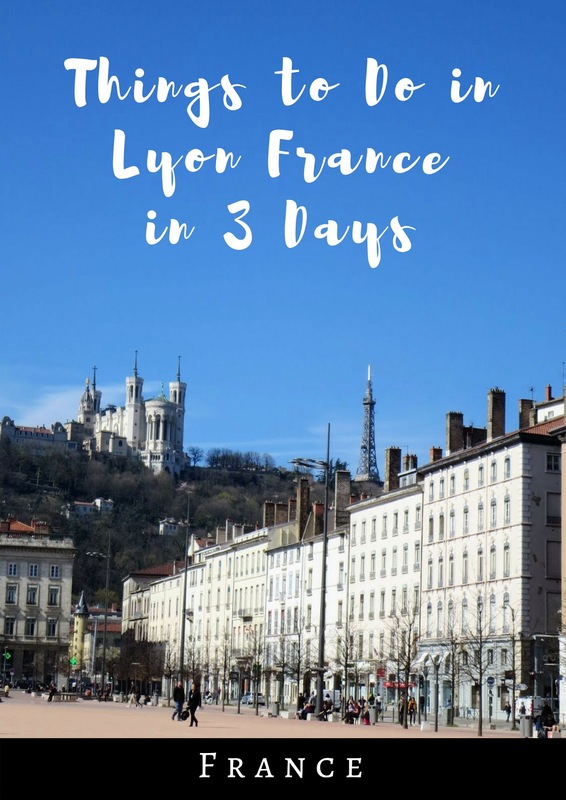 Is Lyon worth visiting? There are so many thing to do in Lyon that it’s easy to fill a long weekend. From Roman ruins to modern markets to explore on the Rhône, Lyon France (France’s third largest city) has something for every taste. Read on for ideas of what to see, do, and eat on a 3 day trip to Lyon. I love European food halls, so we made a special effort to find Les Halles Market soon after we arrived in Lyon. It was mid-morning but already people were sidled up to the bar enjoying a glass of wine. 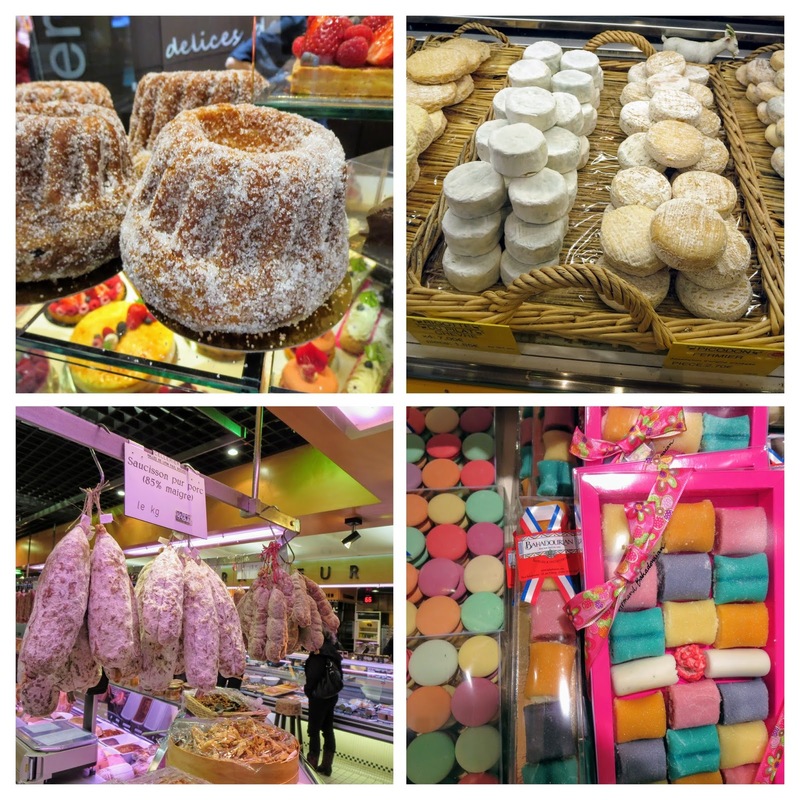 We wandered through the market checking out lovely brioche, giant sausages and a variety of restaurants preparing for lunch. The seafood stall emitted a pungent aroma that revived us after our early morning departure out of Dublin. Delicate rounds of cheese beckoned to us and we picked up a goats' cheese patty to enjoy with a fresh crusty baguette. Pralines (bright red candied nuts) are extremely popular in Lyon and are incorporated into a variety of decadent treats. Delicious sweets confronted us at every turn. Lyon is known for coussins (they look kind of like fig newtons but are really a coated pate de fruit). We picked up an assortment of coussins for later before heading out to explore Lyon properly. Our hotel was located on Presqu'île, an elegant island in the heart of Lyon. We drank in the traditional French architecture as we wound our way through the streets. We soon emerged along the banks of the Rhône. We decided that this would be a perfect spot to stop and enjoy our cheese and baguette. We sat on a park bench and watched the current flow. People passed on foot and by bike below us. Continuing across the river into Presqu'île, we discovered a dancing fountain. A hot dog vendor plied his trade with the weekend lunch crowd. Lyon seems to flow from one fountain-anchored square to another. One fountain even featured mermaids hugging water-spouting fish. Lyon’s Place Bellecour has the distinction of being the largest open square in Europe. We could see the Basilica of Notre-Dame de Fourvière on the hill in the distance. We took measure of the square by walking its four corners. It is indeed quite spacious. We took a moment to admire a statue of Louis XIV before making our way to the conveniently located Hotel Bayard across the street from Place Bellecour. After dropping off our bags, we set our sights on Lyon's Roman Hill. It was quite a gray day. France was suffering from a significant bout of smog when we visited in March. Paris was particularly afflicted but Lyon was not immune. Because of the smog, all public transportation in Lyon was free for the weekend to encourage people not to drive. We gladly boarded the tram headed up to Roman Hill. We debarked the tram halfway up Roman Hill at the Roman Amphitheatre. The steps were dotted with locals and tourists enjoying an afternoon out. We sat down and looked out at the stage imagining what a performance might have looked like in ancient Rome when a high wall would have separated the rich from the poorer masses in attendance. We took the opportunity to sample a praline brioche. I'm guessing these weren't invented in Roman times. We climbed a series of steps from Lyon's Roman Amphitheater toward Basilica of Notre-Dame de Fourvière. The Basilica is definitely one of the most Instagrammable places in Lyon. We soon arrived on the steps of this impressive church. Inside, we admired decadent golden mosaics. The church was dedicated to the Virgin Mary and no expense was spared in its construction. A separate chapel to Mary's husband Joseph was thrown together in the basement. It wasn't nearly as opulent as the builders were running out of money. We finished our tour around Basilica of Notre-Dame de Fourvière by looking up at the golden statue of the Virgin Mary. After exploring Basilica of Notre-Dame de Fourvière, we drank in the sweeping views over Lyon. The views were minorly clouded with smog, but I think because our sights were muted, it made our hearing more acute. As we looked out, we thought we heard the beats of distant drums. We scanned the city below to see if we could pinpoint where the music was coming from. It seemed to be emanating from Saint-Jean-Baptiste Cathedral. We descended Roman Hill in the shadow of Basilica of Notre-Dame de Fourvière. The first signs of spring were showing in the gardens. We descended a steep staircase and emerged among the lanes of Vieux Lyon (Lyon’s old city). A ram pointed the way down Rue du Boeuf. Just beyond a series of restaurants lined the square each with stained glass signpost. The music was getting louder now. We were definitely spot on in pinpointing the location. We were delighted when we emerged onto the square in front of Saint-Jean-Baptiste Cathedral and found a scrappy gang of musicians playing. They added some panache to the music with a bit of dancing. The band seemed to be called Fanfare Piston. Lyon is a university town (not to mention a great study abroad destination in France) and I'm guessing this motley crew was predominantly composed of students. I particularly liked the lads on drums playing with what seemed like casual indifference. We really enjoyed the performance. That's the best part of visiting a new place for us...when we chance upon something unexpected but offbeat and delightful. Hat tip to Fanfare Piston for making our day in Lyon. We decided to let ourselves get a bit lost in Lyon's old city. Shops and restaurants enticed us at every turn. We were impressed by the stained glass signposts of the local establishments. We picked up more local sweet delicacies in Saint Jean Delices. We were amassing quite a collection. We also encountered Lyon's lovable puppet Guignol. Locals sat on the steps outside a nearby hall luxuriating in the weekend afternoon. We concluded our afternoon stroll at BredZ patisserie where we bought ourselves a small sandwich to help us hold off our hunger until dinnertime. Afterall, Lyon France is a consummate foodie destination! The sun soon set on our fun-filled afternoon in Lyon and it was time to seek out dinner. Rue des Marronniers is a famous pedestrianized street of restaurants in Lyon. We took our time perusing the menus at each restaurant. We also enjoyed the lions of Lyon dotting the alley. We settled in at Le Marronnier and kicked things off with a pot lyonnais of local wine. Lyon is located in the Côtes du Rhône wine region and boasts fine wines to complement the city's fine food. We didn't have the courage to try tripe, a lyonnais specialty. However, we did try quenelle (pike souffle-like dumplings over a bed of salad). We also sampled the famous Salad Lyonnais. With bacon and a fried egg on top, how can you go wrong? Of course, crusty French bread accompanied the meal. For our mains, we opted for pork fillets and a local lyonnais sausage. The three-course prix-fixe (options ranged from 15 - 19 EUR) included dessert so we tried tarte tartine and a praline tarte. We really enjoyed the unassuming ambiance of Le Marronnier. There was even a special table overlooking the whole restaurant from above. 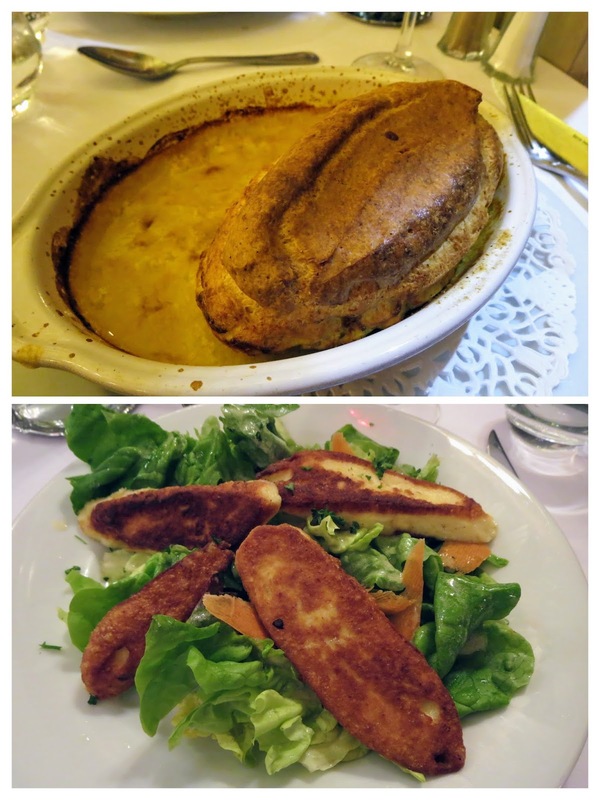 We enjoyed Le Marronnier so much that we actually went there two nights in a row! We woke up to a gloriously sunny Sunday morning in Lyon. The smog that was plaguing France seemed to have lifted or was blown away by the light breeze in the air. In the shadow of Basilica of Notre-Dame de Fourvière, we went in search of a bite to eat for breakfast. What a difference a bit of sunshine makes! The buildings along the river seemed to glow and the water itself sparkled. We crossed over the Rhône and walked past a gargoyle studded local church. A colorfully dressed window. The praline encrusted brioche was the real draw, actually, not to mention the flaky pan au chocolat. Two cafe au lait served in colorful cups rounded out a perfect breakfast in Lyon. Sated and full of sugary sweetness, we set out for a stroll along the Rhône River. Again, Basilica of Notre-Dame de Fourvière looked down from its perch on the hill. Impressive facades lined the river bank. A gallant statue hinted at lost love. We crossed back over the river further admiring the views as we went. We were soon deposited at the local food market. Rows of stacked baguettes greeted us. Rotisserie chickens turned slowly with the smell of delicious roasted meat radiating all around. Colorful flowers in small pots stood waiting to be bought and planted. A variety of fruits stood at the ready in metal bowls. The Sunday market was simply bustling with locals buying an assortment of fresh local treats. We bid the Sunday market farewell and headed toward the Lyon train station. The weather was nice and we fancied a day trip to Vienne. Vienne is an easy day trip from Lyon and is just an hour away by train. We stepped out of the station and embarked on a Sunday stroll through the sleepy town. The main street was lined with pruned trees still waiting for Spring leaves to bud. We admired the facade of an imposing church. We soon left it behind though for a jaunt across the Rhône. The river runs wide and rapidly through Vienne. We could see the ruined Pipet Fortress in the distance. The other side of the Rhône seemed mostly residential. Imagine our surprise when we walked by an apartment block, went in for a closer look, and found a Roman-era mosaic encased in glass on the ground floor. Very cool! Walking a bit uphill, we stumbled upon a terraced cemetery in Vienne. The gravestones led our eyes uphill toward a small lonely church. Heading back toward town, we spotted the Roman Theatre. An impossibly thin building from the Middle Ages still stood just outside the perimeter of the Roman ruins. Continuing on, we discovered a square boasting the remains of Temple d'Auguste et de Livie. We knew immediately that this was the perfect atmosphere to seek out lunch. We sat down at an outdoor table with stunning views. A Camembert salad, frites and a hearty chicken burger satisfied our growing appetite. A glass of wine made our afternoon, very bacchanalian of us ;-) House white and rose wines plus water were on tap. We walked off our lunch with a final sweep of Vienne before heading back to Lyon for another outstanding evening meal at Le Marrionner. Lyon was pivotal to the birth of cinema thanks to Auguste and Louis Lumière. The Institut Lumière is set in their former home and is a fascinating diversion. The whole neighborhood seemed to have an old movies theme. We stopped at Restaurant Lumiere Kebab for a coffee. The prices were listed out on scene marker boards. Caricatures of famous actors lined the walls and the menu had a filmstrip motif. We soon moved on to check out the museum itself which was housed in a grand urban mansion. The interior had a late 19th/early 20th century opulence. There were early video clips playing throughout. My favorite was the boxing cats which was filmed by Thomas Edison! After our tour of the Institut Lumière, we took a walk through the neighborhood and admired some of the Art Deco architecture from a similar period. We finished our afternoon sojourn in Lyon at Gare Perrache which featured an impressive neon ceiling. It somehow seemed to tie together with our entire afternoon. Le Croix Rousse is a popular hipster neighborhood in Lyon. Situated high above the Vieux Lyon, it also offers splendid views. We took the Metro up to Croix Rousse and wound our way back down on foot to explore some of the traboules (alleyways) that Lyon is famous for. It's impossible to have a hipster neighborhood in any part of the world without a gourmet chocolate shop. We indulged in a chocolate covered marshmallow log taking it to go to savor while admiring the nearby views. We looked out over Lyon from the top of Croix Rousse as the sun was starting to set. We noted the steep stairway running below us and began to wind our way downward. We soon spotted our first traboule. These passages are open to the public at certain times of day and are marked by small, unassuming ceramic arrows. A lot of the really nice traboules run through apartment buildings and are only open in the morning. Another traboule took us to a lovely courtyard lined with shops. We continued along this way until we emerged at the bottom of the hill at the head of Presqu'île. We made our way toward Place des Terreaux admiring the quintessential French architecture along the way. We took a turn around the plaza which featured the Hôtel de Ville de Lyon (City Hall), Salle Rameau and an imposing statue. The Musee des Beaux-Arts de Lyon rounds out this impressive square. We awoke on the final day of our 3 days in Lyon to spectacular sunshine. The smog that was plaguing France during our visit seemed to have lifted. If you look at a map of Lyon, there is a *huge* green space in the top corner, Le Parc de la Tête d'Or. We walked through the magnificent gate into the park. Paths radiated in a number of directions. We decided to take a brief walk along the large pond that seemed to anchor the park. Hanging out near a partially submerged tree, we found a pocket of wildlife including turtles, ducks (red-crested pochards) and large geese. It was definitely an idyllic spot. We sat on a bench for a while watching the birds and turtles go about their day before moving on to see what else the park had in store. Imagine our surprise when we turned a corner in Le Parc de la Tête d'Or and discovered a giraffe! Lyon has a small zoo inside Le Parc de la Tête d'Or. We admired lemurs and gorgeous pink flamingos. Giant pelicans with impressive wingspans swam past. A line-up of turtles sat end-to-end along a partially submerged log. The Lyon Zoo was free to the public making it an ideal thing to do on a weekend trip. It was a beautiful day in Lyon so it was only fitting that we dine al fresco for lunch. We tried the special lunch menu at Les Terrasses Du Pond not far from Le Parc de la Tête d'Or. To start, we had half of a cheesy tart and marinated leeks with a bit of French bread as a welcome addition. For our main, we sampled white fish with rice. Tender beef and golden potatoes rounded out the meal. Before we knew it, our 3 days in Lyon had come to a close but we definitely plan to return. The food was too good to only try once. 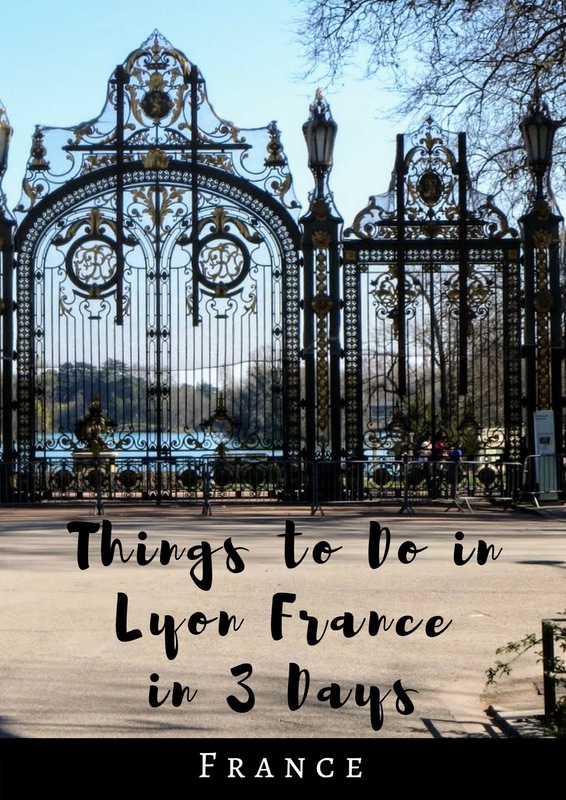 Check out the map of Lyon below to orient yourself around the things to do mentioned in this post. Learn about things to do in Lyon France. Find out why Lyon is worth visiting. Spend 3 days in Lyon with ideas of what to see do and eat.